Our bees have been busy this year, but as the summer is slowly transitioning to fall they are making their own preparations. Even though this is their first year in the hive we’re going to have a decent honey harvest, which is rare for first year bees. Because of their large honey stores they are fairly passive. I got a bit of honey on my glove and they covered my hand. No trying to sting me. They just danced on my hand buzzing away. It was a very interesting feeling. Obviously I wasn’t in any danger because I was wearing a bee suit, but psychologically it was strange. Opening up the hive we realized they were almost completely full. There was only one shallow frame that wasn’t completely filled. It was time to add another honey super. 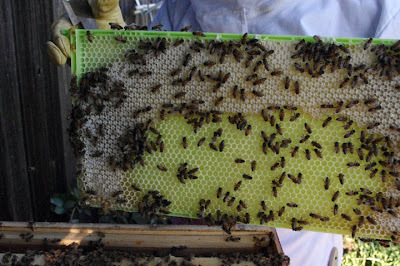 Even if they don’t fill it completely it will at least help keep them from a late swarm. 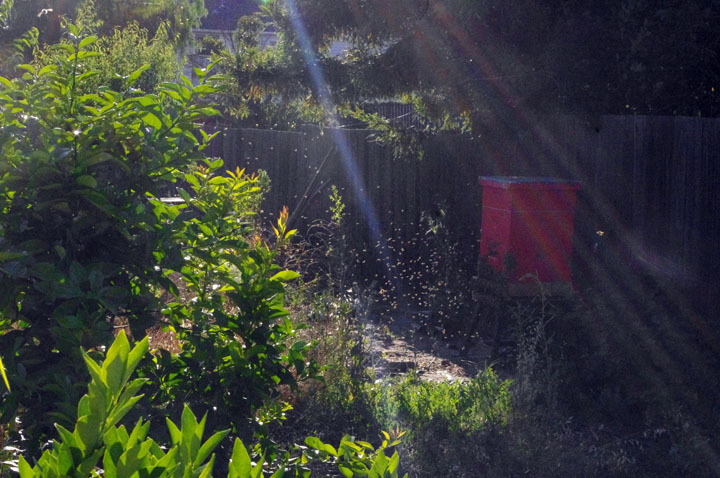 Even in early August we were hearing about peoples’ hives swarming so we wanted to make sure to avoid that. We found the queen in the lower deep super where the brood was. The upper brood chamber was now packed with mostly honey and a smaller amount of brood. There were nearly as many brood frames as earlier in the summer because they no longer have to rush to get their population up. The addition of the drone frames has really helped keep the hive tidy. We’re no longer seeing burr comb or drone brood in odd places all over the hive. Soon we’ll be doing another mite count to make sure we go into winter safely. We decided to go ahead and pull one honey frame from the honey super. We were out of honey and since we don’t have an extractor we decided to just take a small amount for now. The honey was a beautiful golden color. The flavor is distinctive with strong floral tones. You can taste the lavender and citrus blossoms in it. There’s also another flavor that I can’t quite pinpoint. It’s delicious and tastes like home. Oh man, I'm highly allergic to bees and absolutely terrified of them. Those pictures have my heart racing; I can barely look at them. That being said, I'm grateful for what they do in my garden and for beekeepers like yourself. Great job. Nice picture of the honey jars…it makes me want a stained-glass window made of honey….and good job, letting them eat the honey off your glove! Bees are so cool. 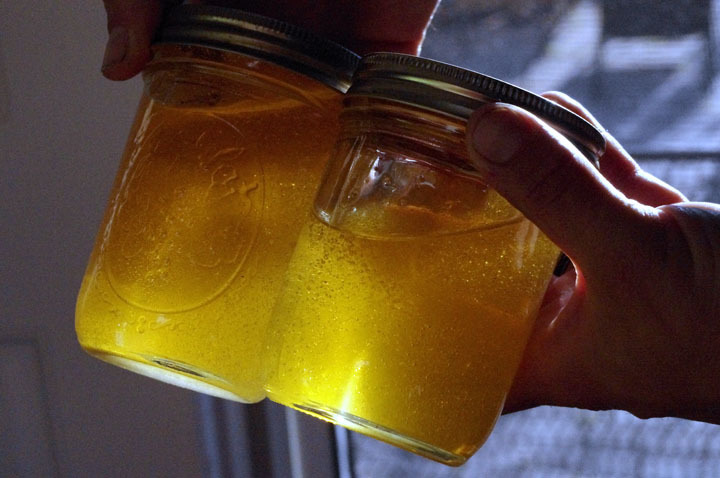 Nice picture of the honey jars. It makes me want a stained-glass window made of honey. 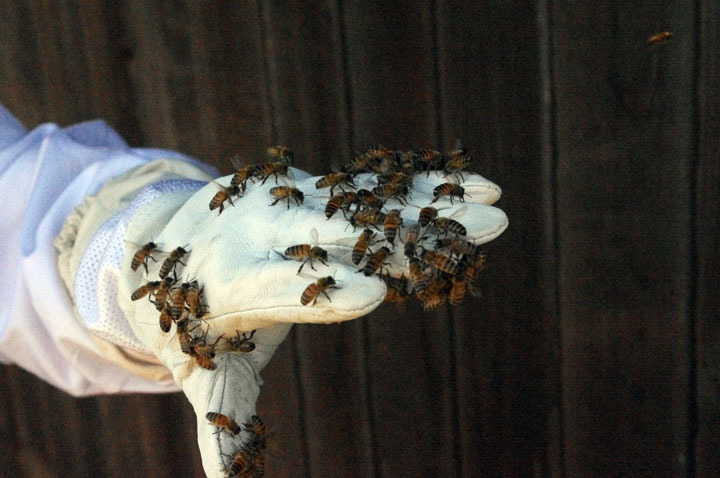 Good job letting the bees enjoy the honey on your glove! Bees are such amazing creatures.